Too Smart for Financial Education? Think Again. 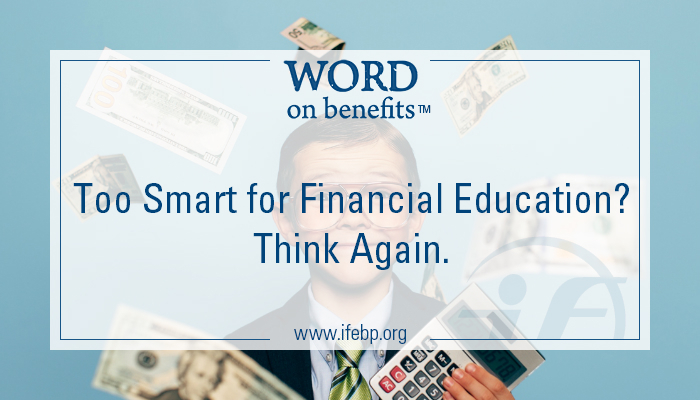 Too Smart for Financial Education? Think Again. Too Smart for Financial Education? Think Again. As I was writing the short blog you can’t wait to read below, I couldn’t help but think of the classic phrase, “The shoemaker’s children always go without shoes.” You’ll find out why in a second. This proverb dates back to the 1500s and essentially means that often people don’t benefit from their own expertise. Fun fact: My great-grandfather was a shoemaker, but upon digging through old family photos, his kids had shoes. But I digress . . .
After a company-wide evaluation, SunTrust Bank realized many of its 25,000 employees (they refer to employees as “teammates”) were struggling with finances (“going without shoes”), including not having an emergency savings account. I’m paraphrasing how SunTrust responded from First Vice President and Financial and Physical Well-Being Manager, Katherine Brune. As a financial services company, SunTrust’s focus for their clients is “lighting the way to financial well-being” and they believe that everyone can achieve the financial confidence to pursue a life well spent. After learning a pretty startling statistic that 40% of people would have difficulty coming up with $2,000 to cover an unexpected expense, SunTrust decided to start guiding their own teammates on a path to financial success. They unveiled a 15-month financial fitness program for teammates, with a special focus on emergency savings accounts. Teammates were challenged to set up a savings account (at any bank of their choosing) contributing at least $100 minimum of their own money, followed by a $20 minimum monthly deposit. SunTrust ended up overmatching the funds and experienced a 60% participating rate among teammates and the culture of financial education changing. Building a budget, calculating net worth, and developing a debt management plan were all covered as part of the financial fitness program. Teammates were also required to volunteer in the community (building awareness of financial education) for four hours, which they got paid for. They also needed to take a mandatory “day of purpose” that included eight paid hours to focus on personal finances of any kind. Katherine mentioned that one teammate said that after completing the program, he went from $0 in his savings account to over $2,000, he and his wife are much closer to paying off debt, and he raised his credit score by 100 points. An unexpected car repair and medical emergency came up, both which were paid off immediately. Katherine said this is just one of hundreds of stories coming in about the program’s success. SunTrust is making sure everyone’s feet and finances are covered, paving the path to financial well-being for their clients and teammates. To hear Katherine’s full account and more stories, visit our Financial Education for Retirement Security.